At the time our earliest known ancestors lived, most of the farmers in the region were "Heuermann" (tenant) farmers. But our Wittrock ancestors actually owned their land and are referred to as "Kötters" (cottage farmers) in the old records. 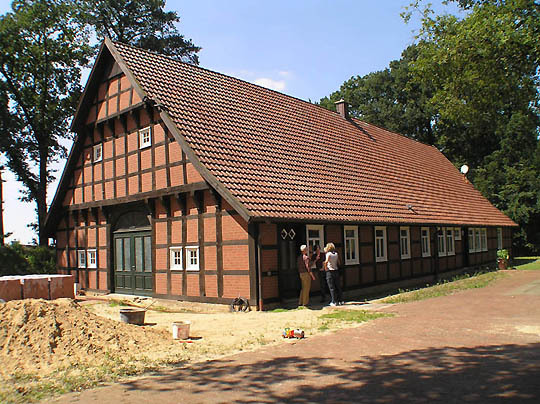 The small Wittrock farm was located in the Brockdorf community near Dinklage, Kreis Vechta, Oldenburg, which is now called Niedersachsen (Lower Saxony). 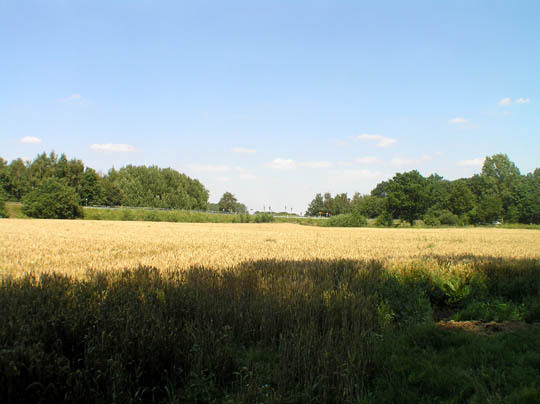 The land was owned by the Wittrocks since at least the mid 1600s, and probably earlier. Ownership of the farm was passed to successive generations of Wittrocks until it was finally sold in 1885 by (Anton) Henry Wittrock (1851-1923) before he emigrated from Germany and settled in America. 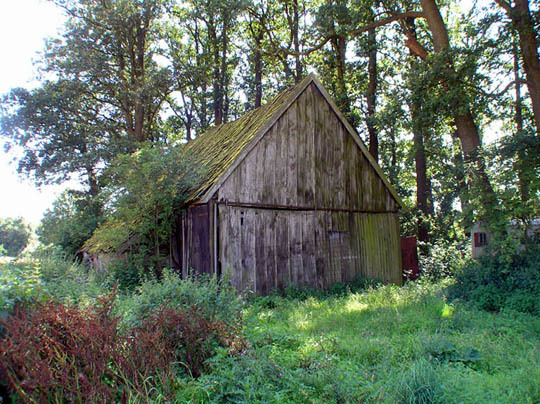 The Wittrock house was a traditional "Hallenhaus"  a combined house and barn  of the type that most of the northern German cottage farmers occupied until the mid-1900s. Tenant farmers lived in smaller huts called "Heurerhauses." Hundreds of Hallenhauses still exist and many have been converted to modern houses or other buildings. The farmers lived in the same building with their cattle and horses. Sometimes more than one family occupied a single building  sharing the barn and cooking areas. The eldest son and his family often lived in his parent's house until he inherited the farm. The farm house is gone now but one of the original farm buildings is still standing. The house/barn once stood in the field just to the left of the building in the photo. The house and barns belonging to the current owners are just to the right of this old building. Some of them are also also quite old. This field just to the left of the old building is the place where the Wittrock farm house once stood. The house was torn down and reconstructed at its current location near the road to Steinfield many years ago, after Henry Nieland emigrated. Steinfeld is located a few kilometers southeast of Brockdorf. The Wittrock house was a probably a typical Hallenhause design. The arched door at the end of the building was the main entrance to the barn area. There were stalls long the sides of the building and hay or grain was stored in the loft. The floor was packed earth. At the far end (away from the door) the family built its cooking fire with a single pot hung over it on a moveable "boom". The family ate their meals in the cooking area. There was no flue or any other way for the smoke to get out so meat was hung over the cooking area to cure in the smoke. The family had their sleeping quarters at the back, beyond the cooking area. Farm hands slept in the barn area. The rooms were rarely heated. The family slept in small enclosed chambers on straw filled mattress. Several people would sleep in each chamber -- sitting up or leaning against the walls. They didn't start sleeping in open air beds until the 20th century. About 1900 (after Henry and his sisters emigrated) some farmers started to get wood burning stoves with a flue to carry the smoke to the outside.